b Proclaimed "Eternal President of the Republic" after his death. ↑ "Kim Il Sung". American Heritage Dictionary of the English Language (Fifth संस्करण). n.d.. http://www.thefreedictionary.com/Kim+Il+Sung. अन्तिम पहुँच मिति: 6 March 2017. ↑ Jasper Becker (1 May 2005). 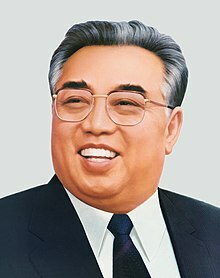 Rogue Regime : Kim Jong Il and the Looming Threat of North Korea. Oxford University Press. . Archived from the original on 18 May 2016. https://web.archive.org/web/20160518110150/https://books.google.com/books?id=UpZWfYqiVLMC&pg=44.